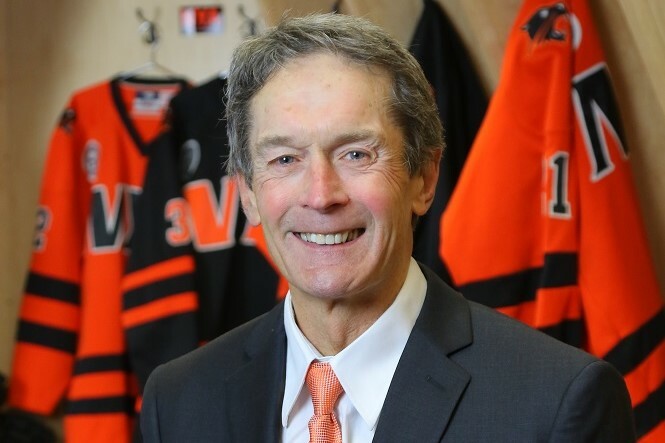 Former Bowdoin College Men’s Ice Hockey Head Coach, Terry Meagher, has signed on to be an assistant coach with the North Yarmouth Academy (NYA) Boys Ice Hockey Team. Meagher stepped off the Bowdoin College Men’s Ice Hockey bench in 2016 after 33 years at the helm. He ranks sixth all-time in NCAA Division III total victories with a 529-245-54 (.671) record. This includes two NESCAC and two ECAC Championship titles. NYA Boys Ice Hockey Head Coach Mike Warde and Meagher have known each other for years through the Maine hockey community. They worked together at a hockey camp this past summer where Meagher saw Warde in his coaching element. Warde’s leadership skills, philosophical beliefs, and long-term vision for the NYA program impressed Meagher. The two coaches then got to talking. “My visits to the NYA campus to discuss the possibility of joining the team were enjoyable and enlightening,” said Meagher. “It is a wonderful place with committed professionals. I am well aware of the tradition of excellence at NYA and know many of the school’s iconic student-athletes. Once I met some of our current players, my decision was easy,” he explained.